In the early post-war decades, protest against the nuclear arms race grew slowly but substantially. It is estimated that in 1960, between 60,000 and 100,000 protesters associated with the British Campaign for Nuclear Disarmament (CND) took part in a rally in Trafalgar Square, the final stop on the CND’s flagship march from the nuclear weapons facility at Aldermaston – a sizeable act of protest with far-reaching social and political implications. Holger Nehring’s monograph gives us a detail-rich comparative study of the CND and two parallel West German organizations, the Campaign against Atomic Death and the Easter Marches of Nuclear Weapons Opponents. Tracing the origins, motivations, goals and influence of these organizations through an impressively wide range of archival sources, Nehring paints a portrait of anti-nuclear protest in the early Cold War decades that highlights the ways in which British and West German history became entangled in the wake of the Second World War. Nehring slots his own work into an emerging historiographical trend – one that includes historians such as U.S.-based Quinn Slobodian – that attempts to re-think the links between the international and the local in post-war protest movements, by emphasizing concrete interactions between activists. This book is a valuable contribution to this evolving field. Because Nehring embeds the comparison of British and West German anti-nuclear movements in every chapter, his exploration of both the symbolic and the concrete links between these activist organizations sheds light on the complex tangle of relationships that characterized these groups at both the local and transnational level. Particularly interesting is Nehring’s analysis of movement membership: we see these organizations as wonderfully diverse, including Christians, intellectuals, trade union activists, members of youth groups, and pacifists, and both men and women. By emphasizing their diversity, Nehring suggests not only that activists were far from being a homogenous group, but that their relationship to the societies around them was also richly layered. Indeed, Nehring challenges the notion that mainstream politics and oppositional movements had little to say to each other in this period. He effectively demonstrates that anti-nuclear activists, or at least those who held the reins in each of these organizations, were both embedded in and influential in their respective societies, and had significant connections to mainstream politics. He convincingly argues that conceptual categories such as ‘left versus right’ or ‘fringe versus centre’, so often applied to protest movements in the post-war period, are not the most useful if we want to understand who joined these organizations, and what motivated participation. Nehring’s careful, comparative approach has a number of strengths. It provides a robust analysis that succeeds in emphasizing both diversity at the local level and interconnections at the transnational level, highlighting the commonalities of experience in these two societies in the early post-war decades. In this way, the study of these protest organizations adds valuable detail to our broader understanding of the nature of the Cold War in Western Europe in its early phase. Yet at the same time, Nehring’s focus on the organizations themselves, on their structure, composition and goals, sometimes rather obscures our sense of what it felt like to participate in these movements. He starts from the suggestion that the book will focus on ‘what international politics meant to people in Britain and West Germany from the end of the Second World War into the late 1960s’ (p. 1), but the feelings and experiences of real people are sometimes hard to access in the text. His sociological approach paints a broad picture of who entered these organizations and why, and yet the emotions, choices, commitments and disappointments of rank-and-file activists never strongly emerge. Where individual trajectories are discussed, they are generally those of movement leaders or influential figures, such as historian and CND supporter A.J.P. Taylor or Easter March founder Hans-Konrad Tempel. The voices of ordinary members often remain out of view. There are times, as well, when the reader might wish for a deeper analysis of the disconnect between organizational rhetoric and realities on the ground. For example, Nehring offers a nuanced discussion of gender throughout the text, yet at the same time seems to assume that a movement culture that de-emphasized gender differences easily translated into a flattened gender dynamic within these movements. Likewise, his discussion of the emotional restraint of the activists seems to suggest that a rhetoric of rationality, honed by movement leaders, led directly to a denial of emotions on the part of rank-and-file activists. It is difficult, however, to square the dedication of these activists with Nehring’s vision of rationality, restraint and denial. One does not need to subscribe to the view that emotions are the principal driver of political actions to see that ordinary activists might well have paid lip service to emotional restraint, while at the same time feeling and experiencing a range of emotions, from joy to anger, that fed their participation in these organizations. This book speaks clearly and convincingly about organizations, but less so about the individual agents who threw their lot in with these organizations. This is, however, a valuable and important study, one that makes great strides towards challenging the ‘left-versus-right’ dynamic that sits at the heart of so many studies of post-war protest, and particularly those that focus on the 1960s. The book will be of particular interest to those researching protest in a transnational perspective – which, as Nehring demonstrates, was as much about concrete exchange and experience as it was about ‘imagined communities’ of solidarity. 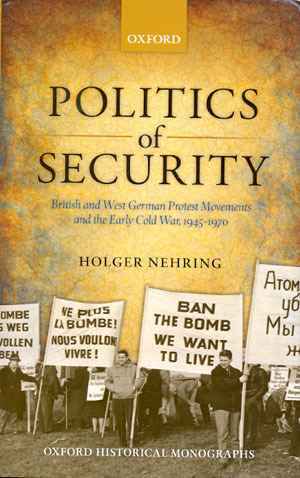 Rebecca Clifford: Rezension zu: Nehring, Holger: Politics of Security. British and West German Protest Movements and the Early Cold War, 1945–1970. Oxford 2013 , in: H-Soz-Kult, 10.09.2014, <www.hsozkult.de/publicationreview/id/rezbuecher-20769>.